Defence chiefs stood accused last night of a catalogue of failures which led to one of the darkest days in the history of RAF Lossiemouth. 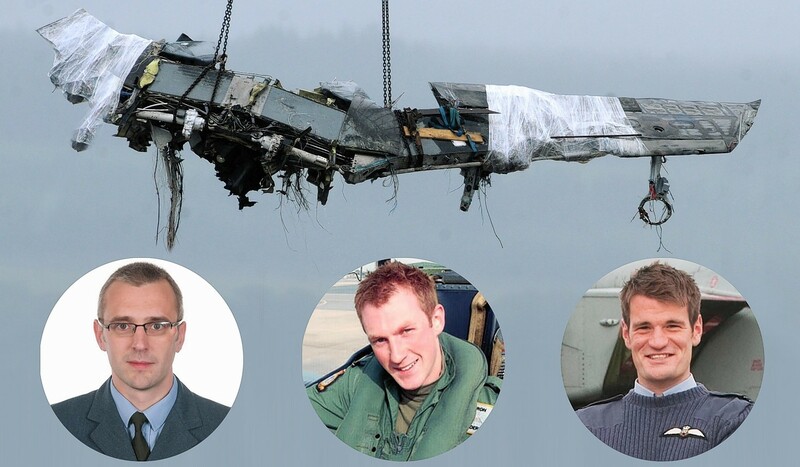 Investigators outlined 17 factors which contributed to the Tornado jets crash off the Highland coast, and the deaths of three Moray-based pilots. It was revealed that one of the most experienced air crew had sought medical help for a anxiety disorder linked to flying just weeks before he died in the tragedy. The Ministry of Defence was also under fresh fire for failing to fit the jets with a crash warning system. The findings triggered renewed calls for a fatal accident inquiry into the deaths of Flight Lieutenant Adam Sanders, Squadron Leader Samuel Bailey and Flight Lieutenant Hywel Poole. The Military Aviation Authority’s (MAA) inquiry into the incident was completed last year, but only published the 278-page report yesterday, just days before the base is die to mark the second anniversary on Thursday. It concluded that the cause was a lack of recognition of converging flight paths, leading the two jets to collide in the same airspace. But the investigators also produced a long list of contributory factors, raising major safety concerns. It included the failure of the care plan for the crew member with an anxiety disorder, the lack of a crash warning system, ineffective planning and supervision, poor procedures at the bombing range at Tain, radar problems at Lossiemouth, issues with locator beacons and survival training at sea, doubts about some of the decisions taken by crew members on the day, and bad weather. Angus Robertson, Moray MP and SNP defence spokesman, said: “This report is extremely distressing for the families involved and damning for the MoD. His call for an inquiry was echoed by Flt Lt Poole’s family last night. In a statement to parliament, Defence Minister Anna Soubry said: “The recommendations from the report have either been addressed or are in the process of being addressed. The crash happened at 12.01pm on July 3, 2012, about seven nautical miles south-east of Helmsdale, at about 920ft. The crews were on separate training missions, and were headed for a firing range at Tain when they collided in poor weather. The sole survivor has no memory of the incident. Salvage operations found a trail of debris in the Moray Firth. MAA director general Air Marshal Richard Garwood said he believed the “lack of situational awareness of each others sortie, from the planning phase right through to the actual collision, was highly significant”. He added that not fitting a crash warning system to the Typhoon jets, which are currently replacing the Tornados at RAF Lossiemouth, would not now be sustainable. An MoD spokesman said: “While accidents like this are very rare, this demonstrates that military flying can never be without risk.